Automatic Sliding Gates Motor Electromechanical gear Motor ideal for residential Sliding Gates. complete with encoder, magnetic limits and advanced built-in control unit. safe and precise thanks to the encoder and the slowing down in opening and closing. practical thanks to the control unit with plug-in receiver and self-learning function. the buffer batteries (optional) are housed directly inside the motor, fast adjustable speed up to 16m/minute. reliable with a sturdy aluminium base treated against oxidation and a powerful 24 vdc motor on bearings. Sliding Gates Motor are gates which use a ground mounted track for the gate wheels to move on. tracked Sliding Gates can span larger opening widths. optionally a pedestrian Gate can be integrated with these type of Gates or a separate pedestrian gate can be built. Automatic Boom Barrier, also known as a boom gate, is a bar, or pole pivoted to allow the boom to block vehicular access through a controlled point. Automatic Boom Barrier can be operated through: Push Button Remote Control RFID Tags / RFID UHF Reader Loop Detectors Any third party access control device Buy Now!! +91-9310159634 For more info:http://pioneersystems.in/pages/Automatic-Boom-Barriers-With-RFID-UHF-Reader-/56b323639ec6680b48e964b3 Pioneer Systems - Automatic Boom Barrier in Delhi. 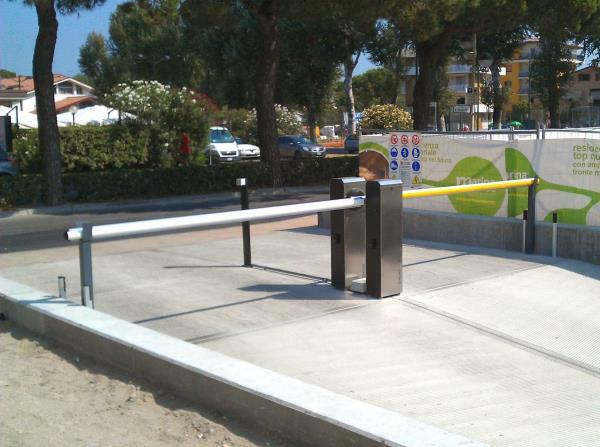 Automatic Barrier offers efficient security at the exit and the entry points of factories, office complexes, corporate houses, residential , buildings, parking lots, toll tax plazas or any road - way entry where medium to heavy traffic is expected. there are various technologies for an Automatic Boom Barrier. one of them is Electro-Mechanical Boom Barrier. Buy Now!! +91-9310159634 For more info: http://pioneersystems.in/pages/Automatic-Boom-Barriers-With-RFID-UHF-Reader-/56b323639ec6680b48e964b3 Pioneer Systems - Automatic Boom Barrier in India. ARTICULAR ARM FOR SWING GATES Electromechanical 24 V actuators for swing gates up to meters, Ideal for wide columns and where the articulated arms delivers a smooth and fluid movement., adjustable mechanical stops Motor for Swing Gates Swing Gates Motor are fabricated to provide security, convenience and protection against unauthorized intrusion. Aesthetically fabricated these gates are made with square pipes encased in a pipe frame customized to suit the client’s requirements and are finished with spray painting.